In July 14, 1941 Nazi troops reached the nearest approaches to Smolensk. They broke to the city from the southern side of the Krasninsky highway. The desperate parts of the Soviet 16th Army under the command of General Lukin retreated by battle and had no opportunity to prepare properly for the defense of Smolensk, it was necessary to use any means. A combined unit two-battalion composition (which included, additionally, the Smolensk militia and a group of guards), was pulled towards the German tanks and consolidated the artillery regiment (of 26 guns). In the first armed clash, Nazis, who did not expect to find an organized resistance in this direction, suffered heavy losses from the fire of our canons. However, the precisely adjusted interplay between the various branches of the military allowed the enemy to call for reinforcement bombers quickly, and as a result killed many Soviet gunners. However, the bravery and the courage of our soldiers allowed them to delay the marching of the Germans nearly on one day. In 1981, near the Yasennaya village, at the entrance to Smolensk from the southern side, on the the paved road leading to the Krasny village , to commemorate the heroism of the Soviet artillery soldiers in battles against the Nazi invaders during the defense and Smolensk liberation, was set a memorable symbol – a famous Soviet 76-mm ZIS-3 cannon, one of the best and most massive instrument of the Second World War. 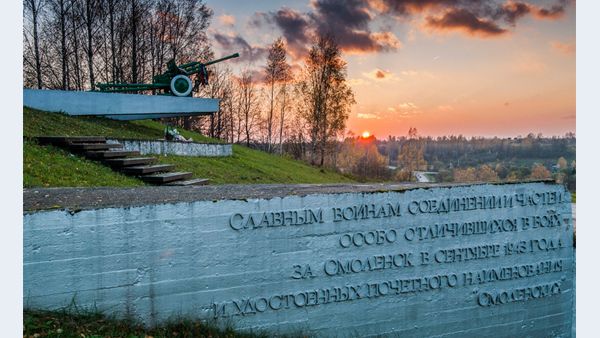 The memorial symbol – the Cannon, set in 1981 in honor of the Guardian unions Soviet troops liberated the Smolensk city in 1943 by the Nazi occupiers, is the object of cultural heritage (the monument of history and culture) of regional importance.